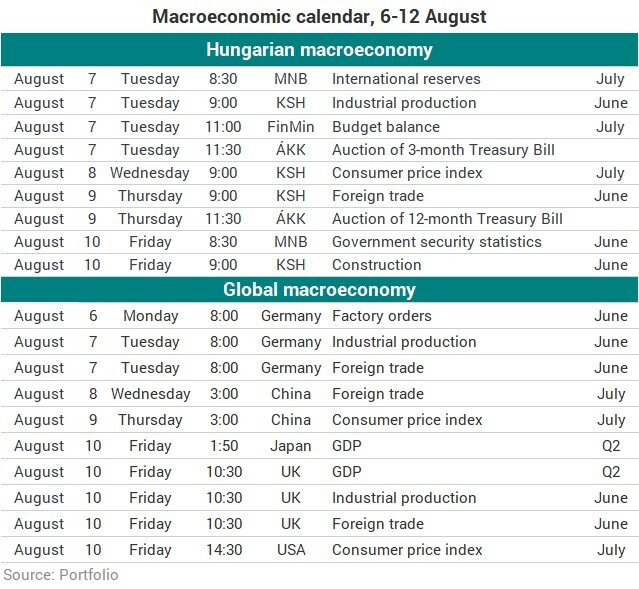 The key macroeconomic release in Hungary this week will be the July inflation data by the Central Statistical Office (KSH) on Wednesday. The CPI print should be watched more closely as it could set the path for the forint in the coming period. Inflation stats are also in the pipeline in the United States at the end of the week, and investors will also be paying attention to British and Japanese GDP data. We’re off to a slow start. On Monday, there’s only factory orders in Germany that deserves our attention. On Tuesday, the Hungarian central bank (MNB) will release its latest international reserves data, and the Central Statistical Office (KSH) will publish industrial production figures for June. The Finance Ministry will disclose the latest general government sector data for July in the morning. Germany will release IP and foreign trade data on this day. For Hungary, the key release this week is definitely inflation stats for July to be published on Wednesday morning, as it will show how temporary the June CPI jump was. And it could have an impact on the forint, especially as the Hungarian currency was stuck in a narrow range between 320 and 322 last week. The CPI print could potentially nudge EUR/HUF out of this range. China is also set to release its latest foreign trade figures early on Wednesday. On Thursday morning, the Hungarian stats office is to release the latest foreign trade figures and FX investors may want to keep an eye on China’s latest inflation data. The last day of the week will feature construction industry figures in Hungary and the central bank’s government security statistics, while exchange rates elsewhere may be affected by GDP releases in Japan and the UK, as well as by U.S. CPI stats.